Inside a cozy Montpelier stationer Monday morning, Gov. 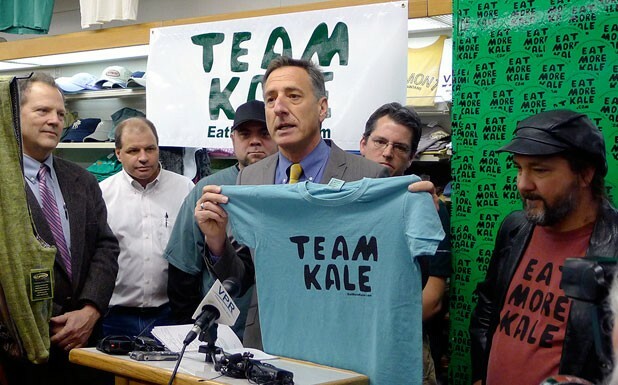 Peter Shumlin kicked off Team Kale, a campaign to help local artist Bo Muller-Moore fight fast-food behemoth Chick-fil-A’s efforts to close his T-shirt business. Muller-Moore, who began making Eat More Kale T-shirts 11 years ago, recently received a letter from Chick-fil-A demanding that he withdraw his application for a federal trademark and turn over his domain name. It was the second time in six years the company had tried to shut him down, claiming Eat More Kale mimicks its “Eat Mor Chikin” ad campaign and confuses consumers. Two weeks ago, Muller-Moore’s lawyer, Dan Richardson of Montpelier, wrote to Chick-fil-A refuting the claim and asking that the company reconsider its position. In the meantime, the story hit the national press, Eat More Kale T-shirt orders exploded and a petition of support gathered more than 17,000 signatures. On Saturday, Muller-Moore received a call from the governor’s office saying the state wanted to help. And so Team Kale was born. Via Muller-Moore’s website, supporters can purchase Team Kale T-shirts and pledge financial support. Though Richardson is working on the case pro bono, legal fees could skyrocket if Chick-fil-A — which did $3.5 billion in sales last year — chooses to fight. “We have to anticipate an aggressive litigation,” said Richardson, who was awaiting a direct response from Chick-fil-A at press time. Muller-Moore, who is working 13- and 14-hour days in response to the spike in orders, says this is a clear case of David versus Goliath: “It wasn’t an easy decision to fight these guys.” He may need all the support he can get: In a statement issued later the same day, Chick-fil-A says it intends to persist. Will the giant company get its way, or will it end up eating more crow?